This will be followed by a modular online programme. Marijke was born and raised in the Netherlands. During her time of studying and painting at art school profound questions arose about the meaning and purpose of life. In the search for self knowledge she came into contact with the Beshara School in the United Kingdom in 1975. Since then Marijke has been involved with various courses and retreats at the Chisholme Institute in Scotland, where she helped design and develop the two-year online study course. 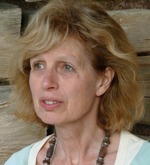 Marijke has also followed a mindfulness teaching course with I AM (Instituut voor Aandacht en Mindfulness) in Belgium.